A sweet portrait of this little lip licking cub, Paul. I also like the forepaw placed on the old dead tree. Lovely image. What a foxy expression- love that, and the paw up on a log. So tempting to annotate this one-(but I won't) It sure must have a story to tell though. Excellent! Great lip curl caught. Gotta love it. 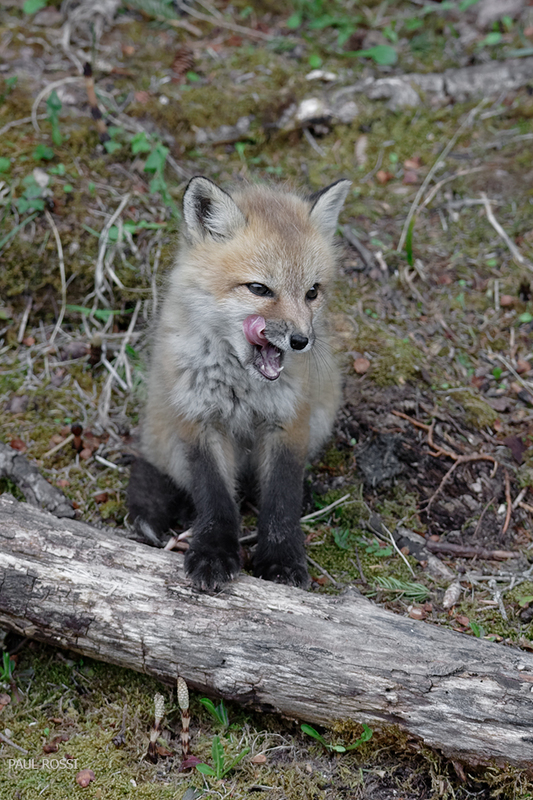 Such a cute little one, licking its chops! Pretty soft light helps so much with this kind of scene. If this were mine, I'd probably crop a bit off the top. My eye tends to wander up to that blank space and reducing the amount of it helps keep my attention on the subject. But that's just a minor suggestion, I like this a lot. Good point. I see what you mean when I crop the top a bit. Very cute image of this kit fox, Paul. I know that it is not always possible, but a lower camera angle really helps provide a more intimate setting in wildlife shots like this. Great timing to catch the tongue out. I was looking for a bird down a ravine from a well-traveled road and my wife said that there was a sleeping fox right in front of me. I couldn't see it initially because it blended in well. The den was in the ravine's sandy banks. Last edited by Paul Rossi on Fri Nov 23, 2018 7:15 pm, edited 1 time in total. Lovely subject Paul. I like the relaxed pose and the tongue. I'm fine with the angle and composition. On my crummy laptop the colours seem a bit cool and undersaturated, not sure what others are viewing though.